Fried On Business host Jim Fried was on-hand for a panel discussion titled CrowdfundCRE: The Rise of Alternative Financing in Commercial Real Estate during the The Miami Real Estate Symposium & Expo sponsored by DisruptCRE and The Miami Brickell Chamber of Commerce. Fried On Business host Jim Fried and his wife, Vivian, joined exercise physiologist Terek Maddox, Detroit Lions NFL star Kevin Smith, and Lauren Book of Lauren’s Kids for an afternoon of positive energy, fun and education with area youth at the Richmond Perrine Optimist Club in Miami. The event was held in July 2013. 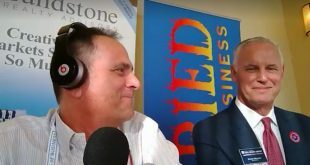 Jim Fried of Fried On Business interviewed David Martin, President and Owner of Terra Group, during the morning keynote presentation Jan. 29 at the Commercial Real Estate Forum: Florida sponsored by Marcus & Millichap and Institutional Property Advisors.